There is no easy answer to the how hot your water should be. It depends. It depends on the makeup of the family, the usage of the family, and safety for the family. When I say safety, this is a two way street. If you look at the chart below, you can see it does not take a high temperature to cause burns especially for the elderly and the young. On the other hand water that is too cool can cause Legionnaire’s disease to form in the water. When a person is exposed to the vapor or water droplets the disease can form in their lungs as pneumonia. Each of these consequences are dire for a family. So what is the best option for the average family? Let’s look at what the maximum temperature at a faucet where a child, an elderly individual or an adult may be scalded. These would be shower, bathtub, and combination bathtub/shower faucets. Very few faucets with separate hot and cold handles can be set for a maximum temperature so the solution for these would be to replace the faucet with a single handle faucet with a temperature limit built into it. The temperature limit must be set for each home since the incoming water temperature to the faucet can vary. The maximum temperature should be set below 120° F, preferably at 115° F. The faucet should also have at least a pressure balance feature. This feature reduces the flow of hot water when it senses a reduction of flow from the cold water supply. This could be caused by a toilet flush, a faucet turned on to cold, or a sprinkler operating. Sinks do not require a maximum temperature on residential applications since higher temperatures may be desired and the thought is that a person could quickly remove their hands from the flow of water if it was extremely hot. In commercial application the code requires a maximum temperature of 120° F at sinks to protect handicap individuals. 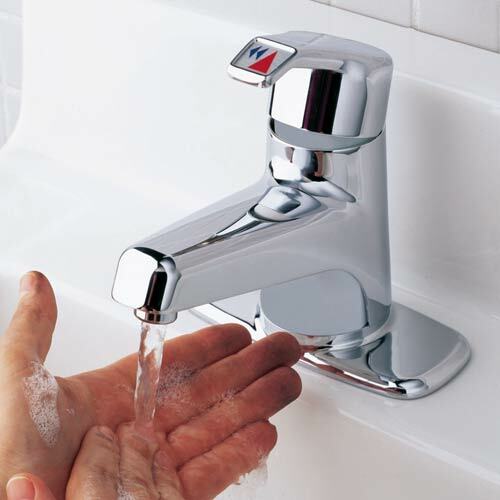 If you have a concern or a need to control the hot water temperature at a sink, there are controls which can be installed at individual sinks. If you keep your water heater at 130° F or lower you are increasing the chances of Legionnaire’s Disease developing within the tank or piping. A water heater set at 120° F can have water inside of it as low as 100° F. The Department of Energy recommends 120° F set point but OSHA recommends 140° F to minimize the formation of the Legionnaire’s Disease bacteria. Safety Note: Hot Water Scald Burn Warning for Infants, Children, Elderly: great care must be taken when exposing infants or children to warm or hot water as they can be badly burned quickly and at shorter exposure times. Our recommendation is to set you tank at a temperature no higher than 140° F also be sure your shower and bathtub faucets are set at 115° F as the maximum temperature. This will provide reasonable protection from scalding and Legionnaire’s Disease. As stated above, if you still have concerns about sink faucet temperatures, a control can be added to the sinks in your home. Contact us for more information or visit our website at www.HomeServiceCorp.com. Home Service Corporation serving our Michigan customers Heating & Air Conditioning , Plumbing and Electrical needs since 1980.